The Grand Banks Yachts has built extraordinary and incredible yachts with classic designs, supreme comfort and precise detailing since the year 1956 and are serious about their responsibility of setting a higher standard in the yacht market. 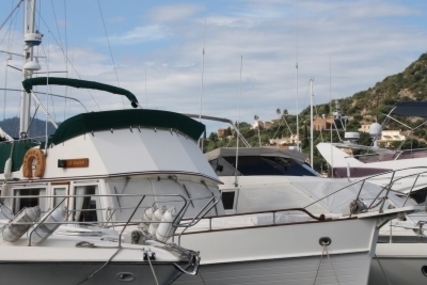 Grand Banks introduced the world to two popular vessel genres, thereby leading and changing the yachting industry. They are: Cruising trawlers and Downeast express cruisers. 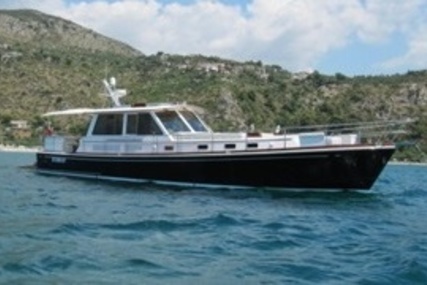 As pioneers in yacht design and construction, Grand Banks is constantly going forward with new objectives and techniques. More perfection in the construction techniques to deliver better yachts are achieved by Grand Banks with their focus on speed and efficiency resulting in yachts that are durable against the natural elements and can take on nature like never before. You attain the best ride with all the trademark comfort and style that Grand Banks has always been loved for. The Grand Banks interiors are very comfortable, open and spacious. It features beautiful classic teak joinery, solid-surface countertops, ceramic sinks and elegant fittings making it a true work of art. Full walk-around decks allow for safe and easy passage to the foredeck, and modern amenities in galleys and staterooms ensure that you’ll definitely feel at home. Grand Banks offers a whole new level of quality and excellence and the new models feature fully infused carbon fiber decks and superstructures for increased strength and weight reduction, allowing for a supervised center of gravity and a splendid stability. Grand Banks has been building classic cruisers for more than 60 years, and from the sophisticated profile of the Eastbay to the timeless lines of the traditional Grand Banks, they take enormous pride in their role as a leading luxury yacht manufacturer who strives to become synonymous with the best quality and amazing performance. 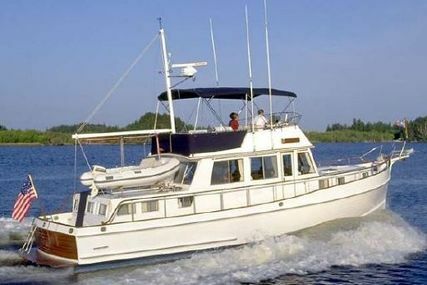 So, select from the many Grand Banks yachts for sale listed at www.rightboat.com and step aboard to make lovely memories with your friends and family. 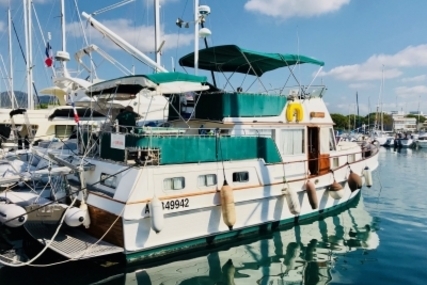 And if you have a pre-owned Grand Banks yacht, you can sell a yacht online through www.rightboat.com where your selling is made easier and simpler. Very pretty boat. Well equiped, avalable now ! 1. When was Grand Banks yachts established? 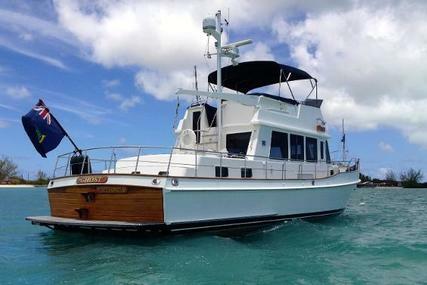 Grand Banks yachts was established in the year 1956. 2. Where is the headquarters of Grand Banks yachts located? 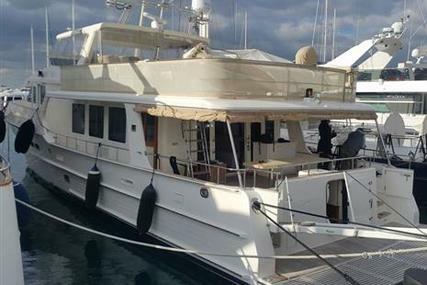 The Grand Banks yachts headquarters is in Singapore. 3. 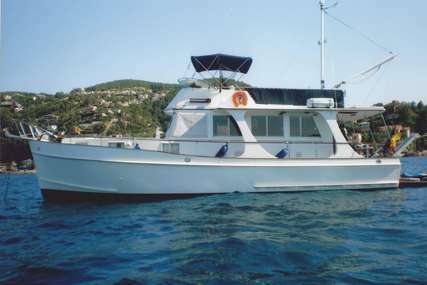 What are the special features of Grand Banks 60? The 19.9 m long stunning new Grand Banks 60 is the most effective and productive cruiser in its class with a ride that undoubtedly exceeds any yacht of its size on the water. 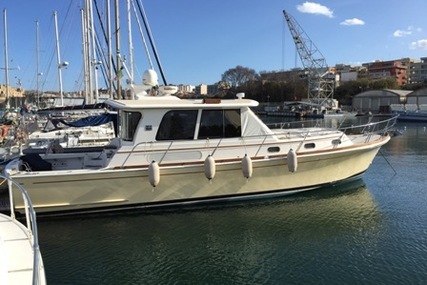 This beautiful and entirely redesigned yacht pays homage to the classic Grand Banks styling, with a special attention on performance, easy handling and fuel consumption. 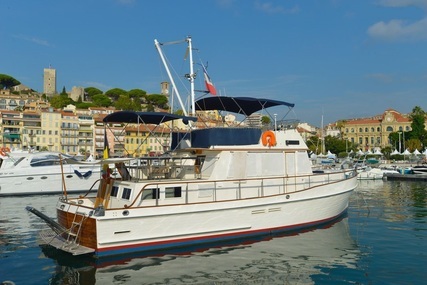 The Grand Banks 60 can reach speeds up to 36 knots, has a range of more than 2,500 nautical miles at 10 knots, and uses an unbelievably efficient 29 gal/hr of fuel 20 knots that makes it the most stable 60-foot monohull flybridge in the world, which performs confidently even in the roughest seas. With the GB60, you experience next-level yachting with multiple advantages in performance, weight, strength, and rigidity. 4. 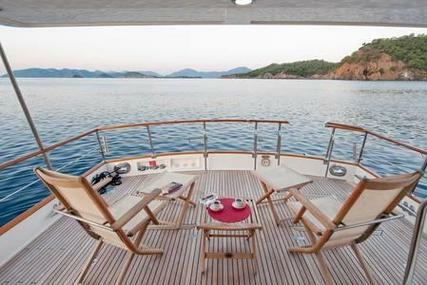 What are the special features of Grand Banks 60 Skylounge? 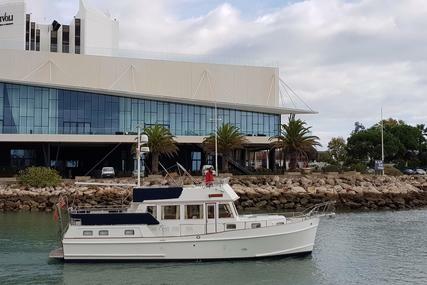 The 19.9 m long Grand Banks 60 Skylounge is best to experience a comfortable cruising in any condition with a Skylounge that is completely climate-controlled. It features an enclosed bridge that adds to more comfort and has an additional living space for you and your friends. It is a true performer with an estimated top speed of 36 knots; 29 gal/hr of fuel at 20 knots; a range of more than 2,500 nautical miles at 10 knots with incredible stability, which lets you feel calm and confident at the helm of this luxury yacht in any ocean conditions. 5. 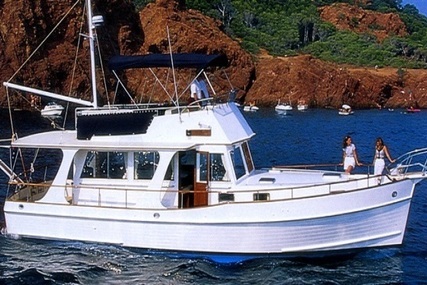 What are the special features of Grand Banks 52? 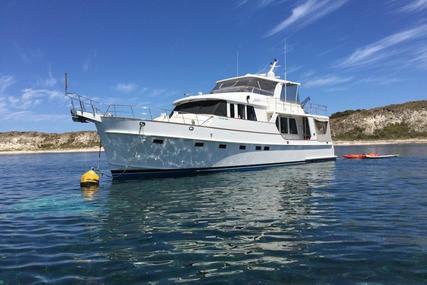 The 18.1 m long Grand Banks 52 is the second addition to the new Grand Banks family series which is an elegantly designed luxury yacht that comes in both flybridge as well as an enclosed sky lounge configurations with two lower-level layout options that can accommodate four people. 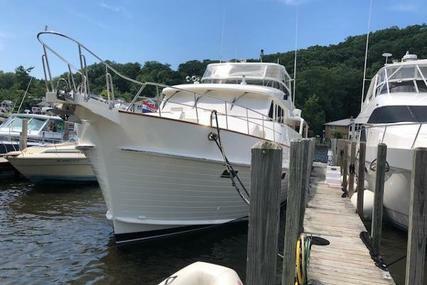 The Grand Banks 52 is a true performer with an estimated top speed of 32 knots and a cruising speed of 28 knots and a fuel burn of 29 gal/20 knots. It is constructed using the latest methods of fully infused carbon fiber to attain toughness, reduced weight and utilize the benefits of modified epoxy vinylester resins that are the benchmark of longevity. 6. What are the special features of Eastbay 44? 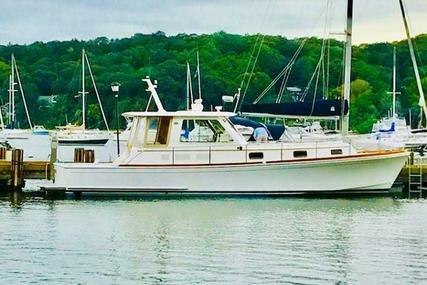 The 14.65 m long Eastbay 44 is the newly developed, sleek and modernized evolution of the classic line that has everything you will ever need on water. 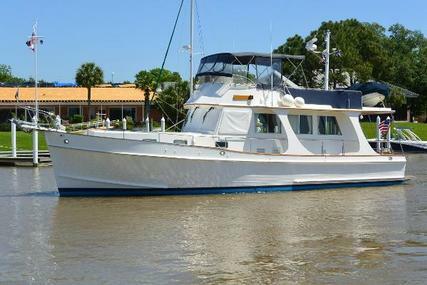 The beautiful teak interior and the flawless workmanship of the three-stateroom layout highlights the classic and clean lines of EB44 that also contains overnight accommodations for six people and entertaining space for more. 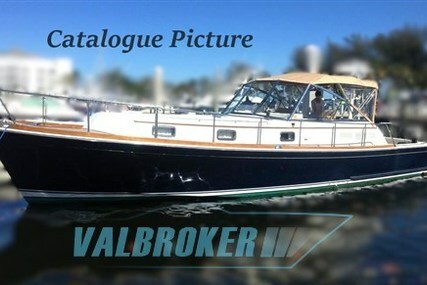 The wide, full-beam salon and cockpit features large electric windows and a traditional deep-v hull acquires a swift, effortless and dry ride that grants a solid maneuverability, making it an ideal family cruiser.